My eldest son, Wen Hao, turns 23 this October. He lives with autism spectrum disorder, epilepsy, and global developmental delay. We received the initial diagnosis when he was just two years old. I remember feeling incredibly sad and confused when I heard the news. He was our first child, and as new parents, his condition was overwhelming and difficult for us to understand and cope with. Wen Hao exhibited many of the classic symptoms of autism. He made no eye contact, refused to speak, and communicated through inarticulate noises. He cried at his own birthday parties. His tight oral muscles prevented him from spitting or opening his mouth for feeding and brushing. He was trapped in a separate world of locks and keys, one we had no access to. In his developmental years, we tried a litany of therapies – I took him for physical therapy, occupational therapy, applied behavior analysis, BrainGym, and Montessori classes, in a bid to improve his condition. He was even placed on a gluten-free diet for two years. Unfortunately, there is no panacea for autism, and so much of our caregiving consists of meeting his daily living needs. With the help of a hired domestic helper, I ensure that he is well fed, that his medication is taken, that he is clean, and that he engages in meaningful home-based learning activities. Club Rainbow has been instrumental in his growth as a person. We first benefited from Club Rainbow’s support when he was hospitalized for a low platelet count during the SARS outbreak in 2003. Then, the Club Rainbow staff from the NUH satellite centre were quick to offer their support. 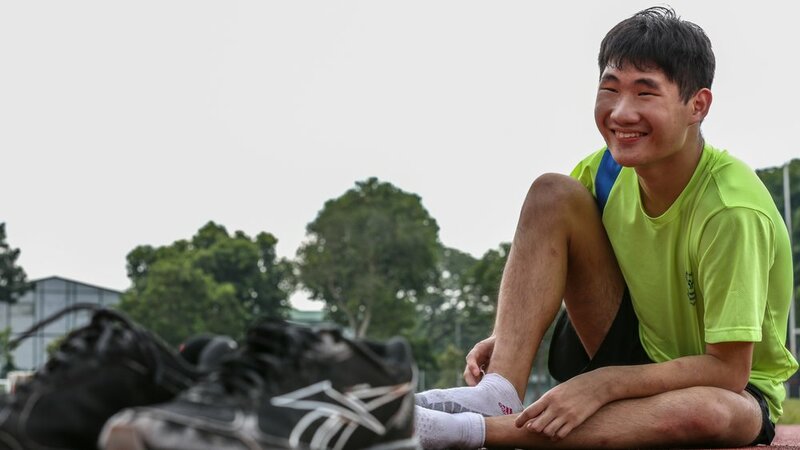 Since then, Wen Hao has received numerous awards and subsidies from Club Rainbow through the years, such as the Talent Development Fund (TDF) Awards for Special Needs and subsidies for his swimming classes. In 2015, I was also presented with the Exemplary Caregiver Award by Club Rainbow. But more importantly, Club Rainbow has created an invaluable network of support for Wen Hao, myself and my family. Thanks to Club Rainbow’s efforts, Wen Hao has attended countless workshops on deejaying, art, and ukulele playing. He has also had the opportunity to go on cruises with my family to Port Dickson, and stay at hotels in Kuala Lumpur, Batam, and Malacca. These are opportunities that, as a special needs child, he would otherwise never have had access to. Through these activities, we have met passionate volunteers and board members who give their all to care for Wen Hao. Club Rainbow empowers children like him to live a meaningful life, enriched with dignity and purpose. We owe much to the words of encouragement and kindness of everyone in the Club Rainbow family. Today Wen Hao remains shy, and likes organization and structure. He no longer throws the temper tantrums like he used to do when he was younger. He is fascinated by radios and CDs, and enjoys listening to music. He is a natural in the water, and has benefited greatly from regular swimming lessons, which have served to stabilize his epileptic fits, and which have been enabled by the TDF awards that he has received from Club Rainbow over the years. Although he has made progress, it is often difficult to keep my spirits up. I am motivated by the desire to give the best care that I can. My dream is that he will be able to take care of himself. My fear is that he cannot, and I am anxious about who will care for him when I am no longer around to provide that attention. Most of all, I worry about how to nurture him when his nature is fundamentally atypical; his special needs require a different plan with different goals and actions. I hope to care for him for as long as I am able-bodied, and that his four siblings will do the same when I am not able to care for him any longer. I would like all parents of special needs children to know that this journey will pass. You must simply give your best for the sake of your special needs child, who cannot do much for you, but who needs your love. Learn to enjoy their presence by your side. This is life. On her 25th anniversary, it is my wish that the Club Rainbow family will continue to grow bigger and stronger, to reach out to ever more beneficiaries and their families around Singapore, so that they too can feel the warmth and care of an inclusive and loving community. Written by Catherine Goh, mother of beneficiary.